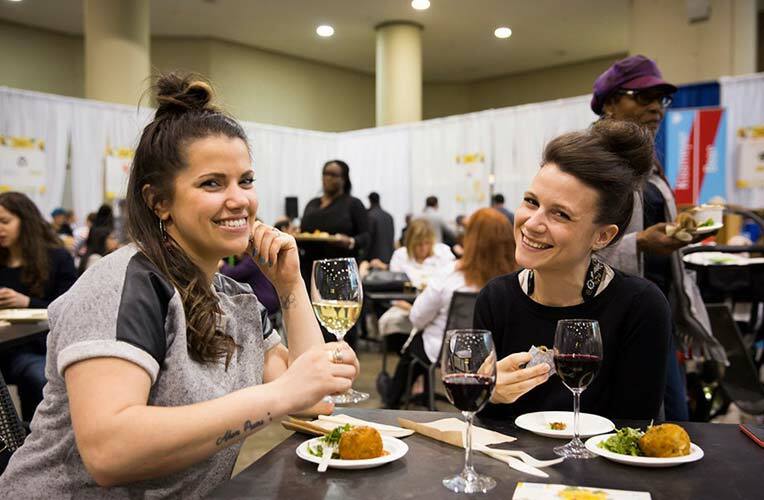 Together with 16 chefs, breweries, and wineries, this year’s Delicious Local Food & Drink Pavilion will be a celebration of the diversity and cultural traditions that make up Canada’s food landscape. 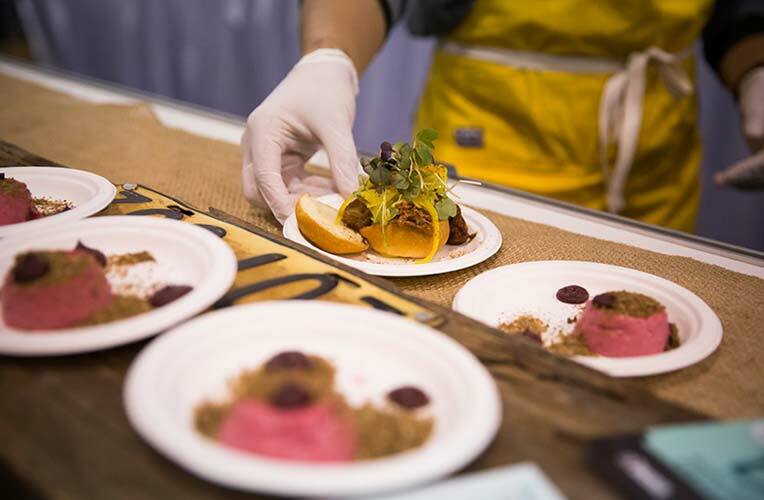 Using local and sustainably sourced Ontario ingredients, chefs from Canada and around the world will showcase old family recipes and favourite dishes that best reflect their heritage. 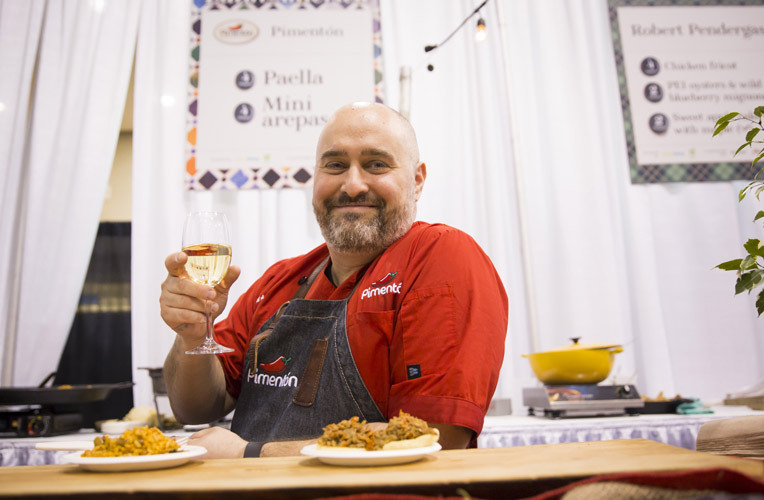 Join us as we applaud the community, vibrancy, and diversity of our country through the many tastes and smells of its global kitchens. Food tickets available for purchase at the Green Living Show Box Office on the main floor and upstairs in the Delicious Local Food & Drink Pavilion. With a base of organic lemon and agave nectar, we mix our seasonal lemonades with house-made fruit blends, sourced from local Ontario farmers and stored throughout the winter for a sip that is sure to be sweet and satisfying. Packed with local Ontario apples, fair-trade organic bananas, green kale, collard greens, and organic cinnamon. A perfect palette balance of fresh, bright, and creamy flavours. Tossed in our house-made creamy Caesar dressing, this kale salad is packed with flavour and toppings including pickled red onions, organic hemp hearts, fresh organic parsley, and our in-house onion bread croutons. Made with local black beans and organic brown rice, topped with house-made sun-dried tomato ketchup, cabbage slaw and pickled red onions, wrapped in an organic collard green. A hearty and delicious snack to satisfy any hungry belly! 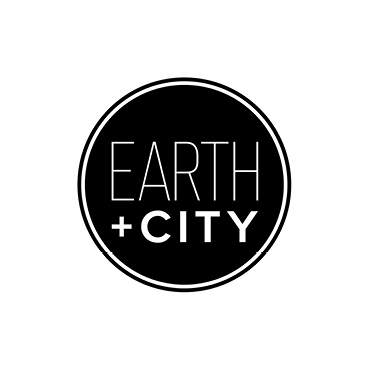 Earth + City is an innovative small food business operating in Toronto. 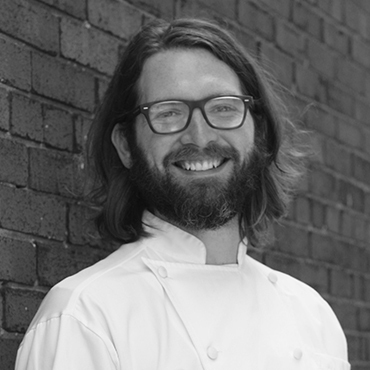 Our mission is to enrich the health and sustainability of our local food community and economy. 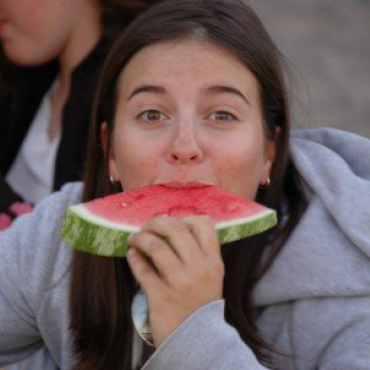 We prepare healthy, nutritious and delicious food in tandem with the Ontario growing season. Our food is plant-based (vegan), gluten-free, and naturally sweetened. We are committed to producing food and drinks in an environmentally sustainable way. We purchase a large portion of our food ingredients direct from small local farms - organic as much as possible - use responsible packaging, utilize innovative waste practices, and so much more! 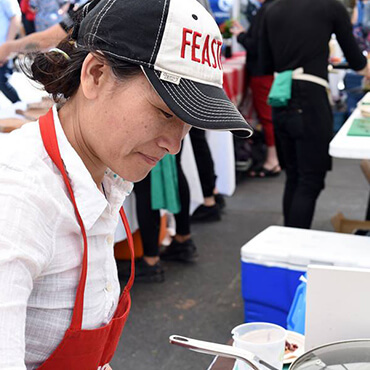 For the past 10 years we've been waffling at the Brickworks farmers market on Saturdays and 6 years at the Leslieville farmers market on Sundays. 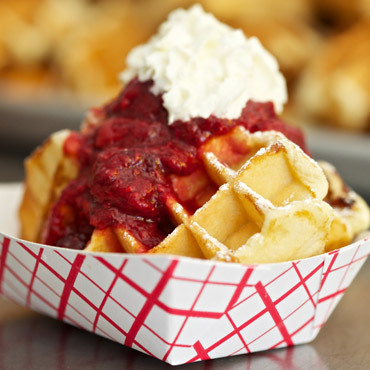 Authentic, wholesome Belgian sugar waffles served by a free range, hormone free Belgian! Six tastes of Ayurveda are reflected in our dishes. Our vision is to present the foods of India from Circa 1526-1947. Using ingredients from Ontario and following the principles of Slow Food we are creating these foods with flavours and styles as interpreted by the visiting peoples. Enjoy these foods from a time of simplicity and true artisanal preparation skill. Rancho Relaxo is a family-run business that specializes in delicious, homemade Mexican food in a warm friendly environment! We use fresh, local ingredients and make everything from scratch. 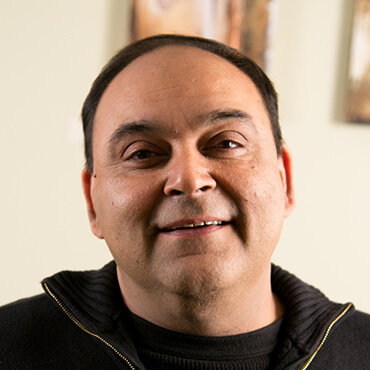 Donnie Blais launched the original Rancho Relaxo in the late ’90s in Kensington Market. 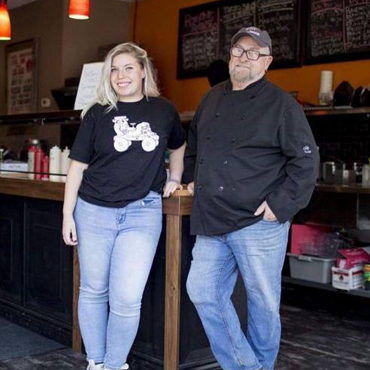 His granddaughter, Angela Blais, launched a new Rancho Relaxo on Dupont Street in 2015. 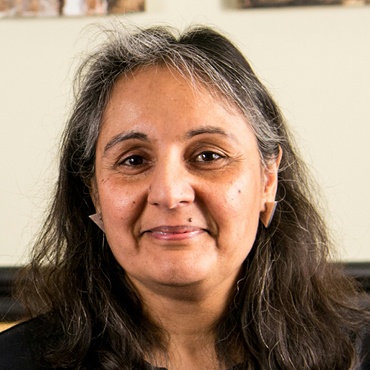 She modernized the original concept, adapting to the fast-paced Toronto lifestyle. 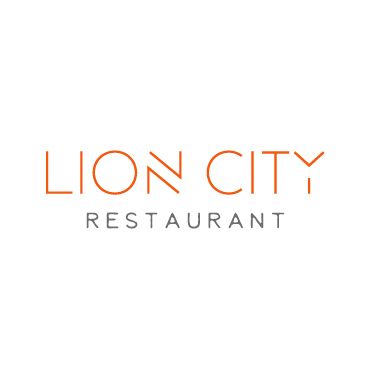 Being a family is the philosophy behind the restaurant, which now has two locations, one in The Junction Triangle and their newest addition in Etobicoke. “I grew up coming to Rancho. It always has a sense of home to it,” says Angela. 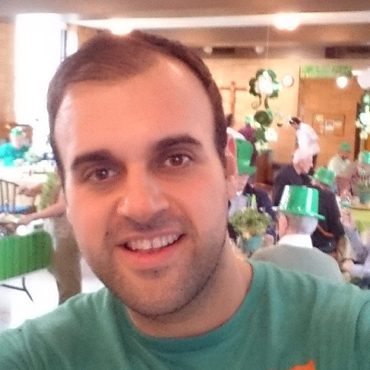 “We wanted to be part of the neighbourhood...this is part of my family I want to make it part of your family too.” We pride ourselves on maintaining a sense of community amongst our customers and look forward to welcoming you! 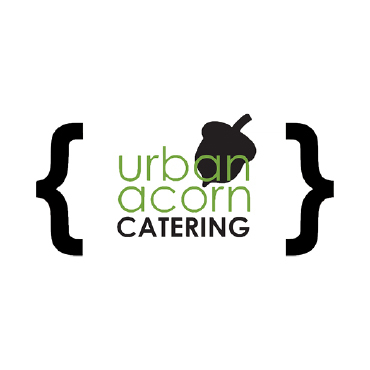 Urban Acorn Catering founders Chef Daniel Holloway and his ‘Boss Lady’ partner Marie Holloway, believe great food is achieved by harnessing bold flavours from humble ingredients. 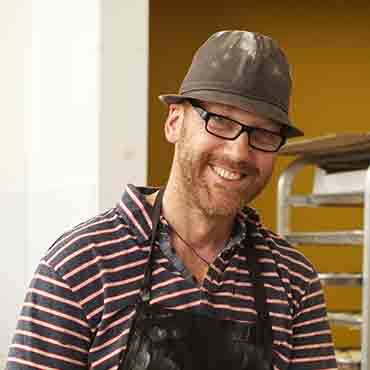 Inspired by art, music, and using food as a dialogue for social change, they want to encourage people to broaden their understanding of food and each other with the hopes of building stronger communities. Their mostly sustainable plant-based 'Flexitarian' approach to cuisine, allows them to seamlessly create menus to both omnivores and vegans. Their philosophy is simple: they believe food should unite, not divide people. Laksa with Rice Noodles, Spicy Broth, ON Chicken - Thick rice noodles in a spicy coconut broth topped with fish cake slices, tofu puffs, cucumber shreds and laksa leaves. 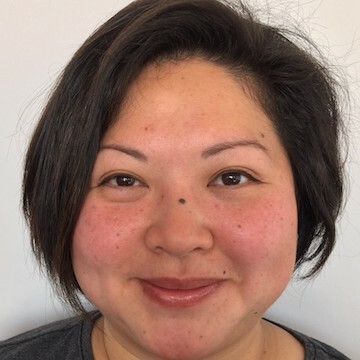 Born and bred in Singapore, Elle moved to Toronto 3.5 years ago. She was bowled over by the accessibility of farm fresh local produce. It was in sharp contrast to Singapore where every food/ingredient is imported to the urban island. She scoured the city's many enclaves for spices/ingredients to recreate the authentic flavours of Singapore. She counts herself lucky to be able to make authentic Singaporean food and work with local produce in this new place she calls home. She hopes to raise the profile of Singaporean food and her heritage Peranakan cuisine. TC Momo’s has been serving their popular Tibetan Momo’s at various farmers markets in Toronto since 2013. Our delicious MoMos, are a Tibetan version of a dumpling. The Tibetan term “MoMo” is widely known and used in Tibet, Nepal and the Northern Himalayan region in India. They can be made with a variety of meat and/or vegetables. There is a range of ingredients and styles of preparing MoMo’s in different parts of the region. 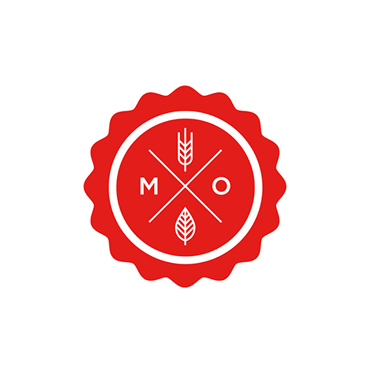 Our Momo’s are handcrafted using fresh, local ingredients from local farmers. We make Vegan MoMos, Ground Beef MoMo’s and Vegan Pasta Noodles served with our delicious homemade hot sauce and pickled cabbage. No shortcuts, no compromises! At Magic oven, we feature seasonal, local and organic produce as much as possible serving free-range chicken and sustainably raised, local all natural meats. Our food is made from scratch, by hand, the old fashioned way. The mantra here is craft deliciousness that is healthy and nourishing! 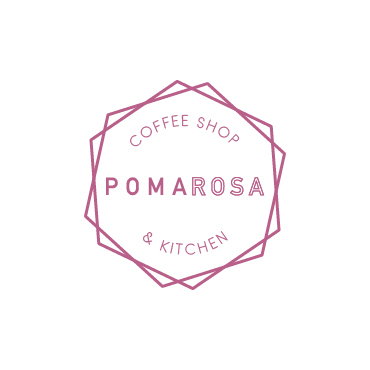 Pomarosa is a South American restaurant and cafe serving elevated Venezuelan street food, snacks, Latin American drinks and coffee shop fare. Our beloved Venezuelan street food, (or Arepas ) are homemade cornmeal sandwiches stuffed with wholesome, fresh, local ingredients. They are naturally gluten free and delicious! If you are looking for a modern version of traditional Venezuelan recipes or, are looking to eat arepas for the first time, Pomarosa is the perfect place! Blyth Cowbell Brewing Co. is a unique Canadian destination craft brewery that features a state-of-the-art brewing facility, restaurant with indoor and outdoor seating, retail store, and entertainment spaces. Cowbell's accessible, family-friendly farm is located on 120-acres south of the historic village of Blyth, and we are committed to providing you with a one-of-a-kind experience, highlighted by delicious craft beer. Crafty Elk's Blueberry, Cranberry, and Acai is the perfect blend of berry flavours. The slight acidity of the cranberry is balanced with the refreshingly tropical flavours of the blueberry and acai. Crafty Elk's Mango Honey will give you the sensation of an exotic mango fresh fruit feel with a subtle aroma of honey and not too sweet taste. 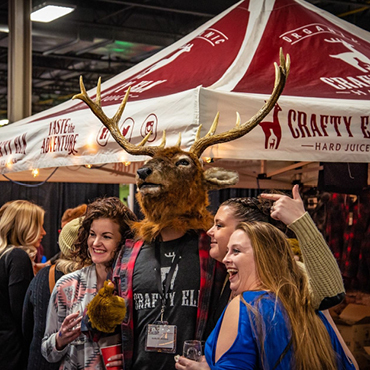 Organic Crafty Elk Hard Juice strikes the perfect balance between fresh aroma and taste profile, capturing the essence of nature and fresh mountain air. We see that a lot of beverages including coolers are filled with sugars, preservatives, artificial flavours and synthetic colours. 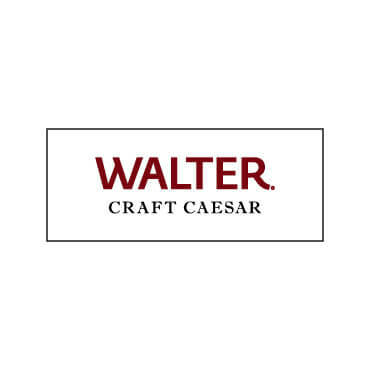 Crafty Elk is a unique product offering a clean ready to drink vodka beverage that is certified organic, with no preservatives and no artificial flavours. Crafty Elk is made with an organic premium vodka, sourced from Piedmont Italy, where the manufacturing practice is highest. Crafty Elk has the highest quality control and manufacturing protocols, to make sure you are delivered a "true flagship beverage". 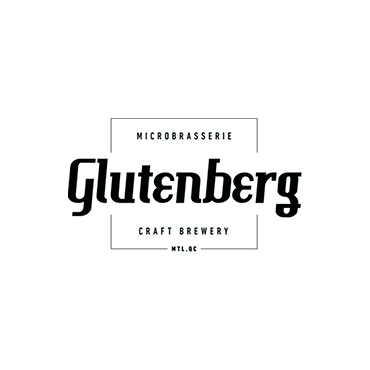 Glutenberg is a Montreal based brewery crafting 100% gluten-free beer. 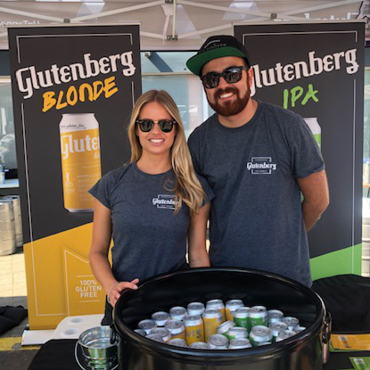 Our ambition was to brew the best gluten-free beers. In our enthusiasm, we created some of the world's best tasting beers, period. 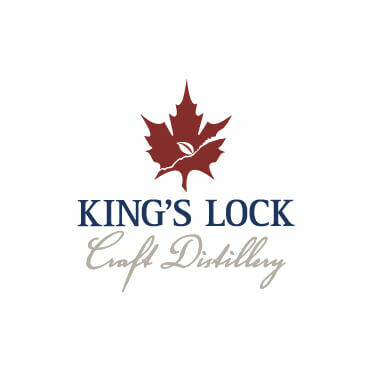 King’s Lock is a family owned and operated business, committed to green operating principles, organic and kosher products all made 100% in Ontario. We buy only local organic grains for grain based products and free trade, organic sugar for our other products. We are Ontario’s only certified organic and certified kosher distillery! 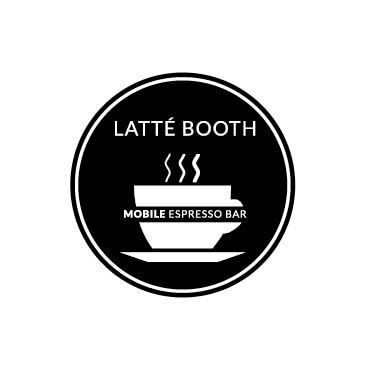 Latte Booth is Canada's largest artisan mobile espresso bar company. We provide high-quality, fair trade, organic coffee micro-roasted in small batches for quality control. Our team of experienced, professional baristas are happy to provide guests with a varied menu, from frothy cappuccinos to mocha lattes. Our state of the art mobile espresso bar booths can be the highlight of your corporate event, wedding, birthday party, or any special event. 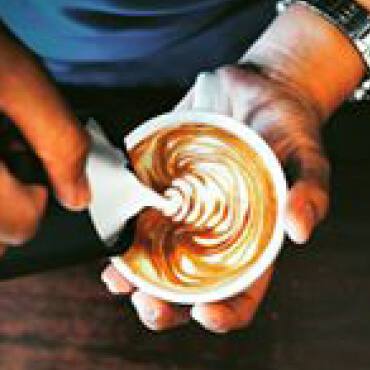 Innovative branding & lifestyle solution for corporate events, we deliver the café experience to your doorstep! 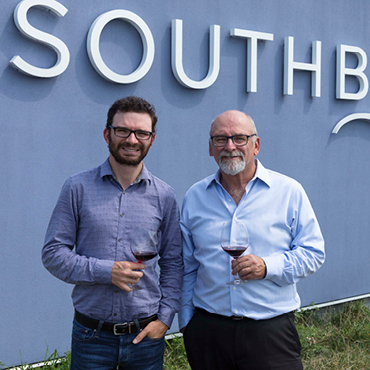 Southbrook Organic Vineyards is the epitome and evolution of Bill Redelmeier’s love story with wine, the land, and all things “local.” The winery is situated on a 150-acre vineyard in the heart of the Niagara Peninsula wine region of Ontario, Canada. We produce organic and biodynamic wines that earn recognition, from critics and consumers alike, year after year.